Congratulations Savannah, You Have Experienced Equal Work! 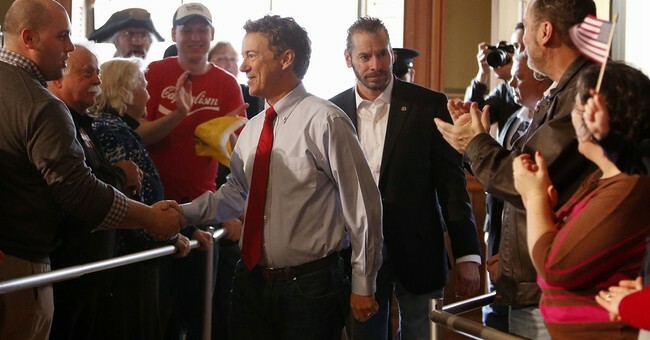 Kentucky Senator Rand Paul’s freshly minted presidential campaign is still looking for traction following the mainstream media's manufactured headlines concerning his ill treatment of female reporters. While there are certainly many Republican primary voters who will appreciate and applaud his aggressive interview style, the media’s reshaping of events as new evidence of the GOP’s phony war on women are likely to resonate with a slice of the more moderate electorate he needs to win in November, 2016 should he become the party’s nominee. But Paul can turn this to his advantage by recognizing the core truth of this media exercise; that framing his recent TV interviews withSavannah Guthrie andKelly Evans as some form of latent misogyny actually reveals the left’s disdain for women and perpetuates sexism. The assertion that a politician must treat women reporters differently than male reporters is repugnant and certainly rubs against "equal pay for equal work." The left’s assumption that a politician cannot push back in an interview with a woman reporter is paternalistic and condescending. It promotes the rubbish that women are somehow incapable of handling themselves in a fast paced, tense and high pressured work setting. Frankly, It’s the same condescension which MSNBC showed Mika Brzezinski by paying her half the salary of her male counterpart, Joe Scarborough. A dispassionate look at these recent interviews is instructive. Paul's Today Show interview with Guthrie was reminiscent of Judge Judy on a bad day. His sin was to interrupt her as she wound her way through a string of issues, meandering past her predetermined judgement that the senator’s positions were “unorthodox.” Paul was absolutely right in pushing back against Guthrie’s gut instinct to accuse versus inquire. Then there’s the interruption issue. Interrupting people is the lifeblood of TV talk shows and the left is particularly adept at it, apparently clinging to the belief that whoever talks loudest wins. All Paul did was to correct Guthrie (a lawyer by trade) on a basic point of journalism. Once that concluded, the rest of the interview went just fine with no further accusations by Guthrie. We saw a similar dynamic in Paul’s February interview with CNBC’s Kelly Evans in which the candidate went so far as to - wait for it - shush a reporter. Paul also corrected the record on several occasions and scolded Evans over loose journalism practices, something for which she apologized on-air. She knew she could have - and should have - done better. And given NBC's overall journalistic record (i.e., Brian Williams) maybe Paul did her a much needed favor. Paul’s demeanor in these two interviews aside - media coaches around the country are still kibitzing on his performances - all he did was stand up for himself and remind his media inquisitors of some journalistic fundamentals. Were he a protected class or just about anyone other than a libertarian-leaning Republican seeking the presidency, these episodes would be ignored as a couple of nothing burgers. But the focus on these two interviews signals to everyone that women reporters must be handled with kid gloves, that they somehow lack the grit or toughness of their male counterparts and must therefore be treated differently. This fake outrage is nothing more than protectionism for women in journalism. The premise is akin to a 1950s male dominated office; the left has determined that ladies are incapable of handling their affairs properly and are deserving of special consideration because of their perceived inabilities. Rand Paul did not treat these women differently so he must be punished by the press. In reality, this is institutional bigotry disguised as benevolence and it’s contemptible. Strong American women like my mother, grandmother and sisters have lived with this Don Draper/Mad Menesque mentality for decades and are increasingly wising-up to the underlying prejudice of it. That’s why it’s so easy to spot when it expands to women broadcasters. It plays to the worst media stereotypes of women who are hired for their good looks while real reporting is left to the sturdy menfolk. Now I have a better understanding of why there is pay disparity at left leaning media outlets like NBC and The New York Times; they don't believe in Equal Work.